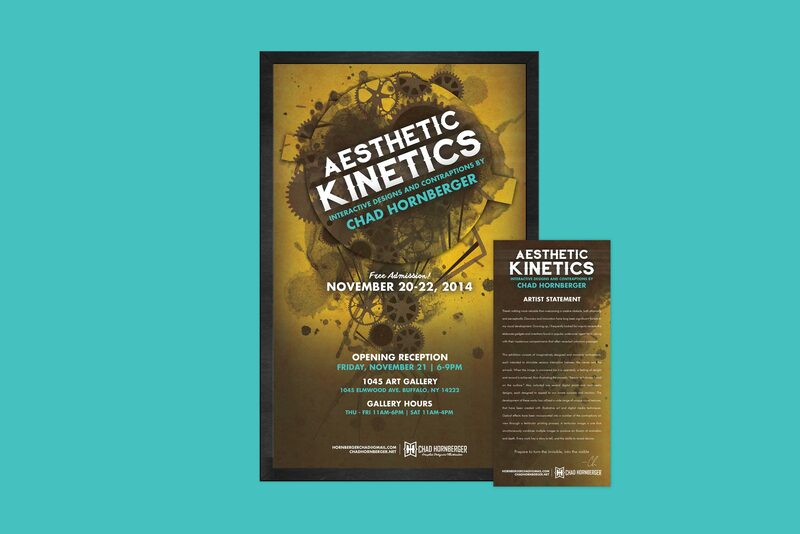 In November 2014, I created and self-promoted AESTHETIC KINETICS: Interactive Designs and Contraptions by Chad Hornberger, located at 1045 Gallery for the Arts in Buffalo, NY. The exhibition featured handmade steampunk-styled movable contraptions, each intended to stimulate sensory interaction between the viewer and the artwork. When the image was uncovered (as it was operated), a feeling of delight and reward was achieved, thus illustrating the proverb, "beauty isn't always found on the surface." Also included were several digital prints and multimedia designs, which incorporated optical effects through a lenticular printing process. A lenticular image is one that simultaneously combines multiple images to produce an illusion of animation and depth.